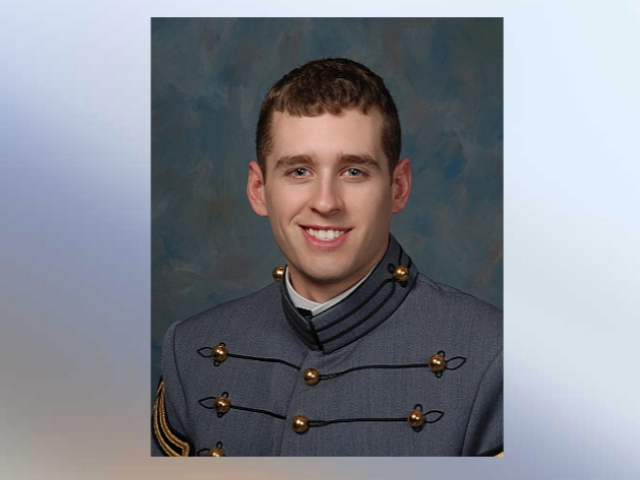 MARIEMONT, Ohio – There was a solemn homecoming Friday for a Mariemont native, West Point graduate and soldier. Captain Jordy Alsfelder, 26, got a hero's welcome after passing away Sunday of a heart attack. Alsfelder was one of three brothers to attend West Point and serve in the Army. He did two tours of duty in Iraq. His family wanted him to have a final journey through his hometown and that's what he got as Patriot Guard Riders escorted the hearse from the airport to the house where he grew up on Center Street. Mariemont police led the way and neighbors stood on the sidewalk to pay their respects. They even lined the street with small American flags to honor him. "It is a very sad day," neighbor Kevin Hassey said. "The family is very dedicated to the country. They have three sons in military service and have given their all to the United States of America." Alsfelder was stationed at Fort Sill, Oklahoma, awaiting to go to South Korea, and had just been promoted two days before he was stricken. Alsfelder was a 2008 graduate of Cincinnati Country Day School and the community there was in mourning Friday. "He was extraordinary and we were heartbroken, all of us here at the school, when we learned this news," said Merle Black, a teacher and coach. Black knew Alsfelder well and called him a superior athlete and student. "He was a cross country runner. He ran the mile in track. I coached him in both those sports," Black said. "He was a point guard on the basketball team. Then, he was a phenomenal student. Even more than that, he was a young man who his classmates adored and loved. Alsfelder always knew that West Point was in his future, just like it was for his two brothers. "He was bent for going into the military," Black said, "but at the same time, he was a gentle young man, but someone who believed very firmly in his country and his desire to serve his country." Visitation is Sunday from 2 p.m. to 6 p.m. at the Gwen Mooney Funeral Home, 2620 Erie Ave. The funeral is Monday at 11 a.m. at Knox Presbyterian Church, 3400 Michigan Ave., with burial in Spring Grove Cemetery.